I’m most interested in Benjamin’s stripe paintings. 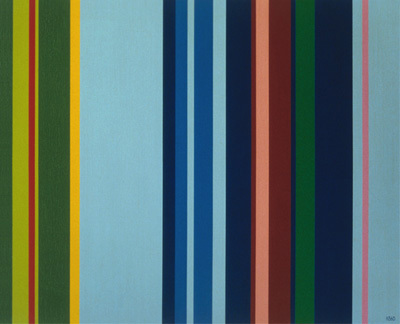 It is interesting that, as noted by Claudline Humblet, that colour values in his paintings are non-systematic (diverging from other stripe painters) such that each stripe has its own autonomy. I was thinking about this in the context of the autonomy of each of the stripes in the current sketch of the Zombie Formalist. The ZF stripes are totally independent and have no relation to one an other; in some cases one stripe may cover up another entirely. Benjamin’s process provides an interesting precedence for the ZF as only thinking about each image component in isolation and not being concerned with overall composition or colour constraint. The value of the overall composition is determined solely by the viewer (as modelled by the machine), so why not provide as much variety as possible? This also may influence the generative approach where I’ve been torn about using an evolutionary method. With an evo approach, there is some stability in the structure of successive generations. Another option is to use a critic (that models the viewer’s sense of value) that is allied to constantly regenerated paintings. This way there is no successive development over time; each painting is unique, fleeting and does not persist through successive generations. Interestingly, Claudine Humblet writes that Benjamin has used chance operations in his colour selection, which fits very well a non-evo approach where each composition has maximal autonomy. 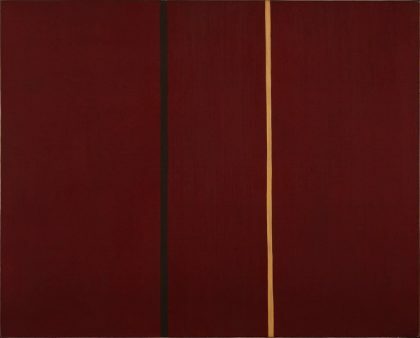 This is also consistent with Benjamin’s process orientation that “accepts the sometimes unexpected results that arise from the process” (Claudine Humblet, The New American Abstraction (1950–1970)). At this point I have three directions of aesthetic exploration for the ZF: (a) Increasing the number of stripes in the current system significantly (I counted as many as 25 stripes in one of Benjamin’s compositions); (b) Use the sine-wave approach to increase the range of possible number of stripes; (c) a sine-wave approach where the parameters are constrained to force a grid-like relation between the different sine-waves. The latter would cut against the autonomy of the sine-waves, but it’s worthwhile exploration. Maybe I’ll completely change my mind once I get to Gene Davis! McLaughlin is another painter with whom I see a lot of conceptual resonance. He was interested in the ‘void’ in Japanese painting in relation to our relationship to nature and the universe. This is somewhat mirrored in my interests in origination and the state of the universe before the big bang, and my ongoing question of the ground in relation to the object. 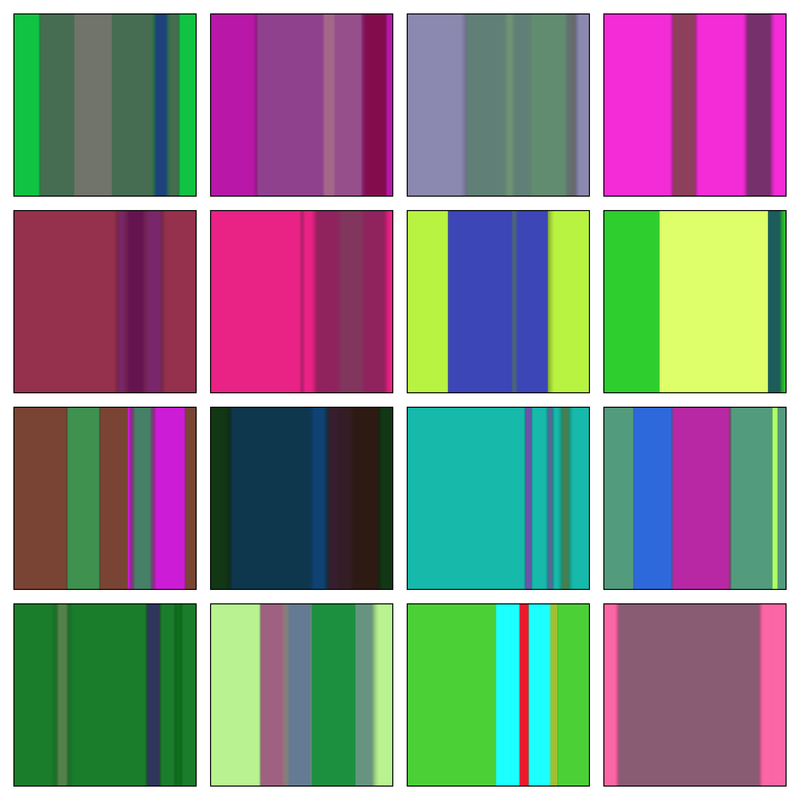 The image above shows a selection of results from the same code used to generate the initial sketches used in Zombie Formalist proposals (included below). I just got access to this code recently as it was on the Shuttle PC used for the Watching and Dreaming exhibition at the Surrey Art Gallery. 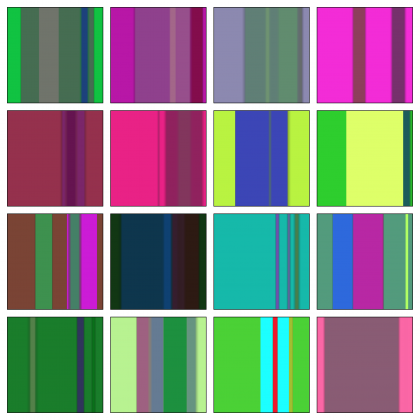 I thought it would be interesting to take another look at these results after doing some of my colour field painting research. One insight is that even though this system is highly random, it often produces some quite interesting results; in fact most of the results are somewhat successful (as much as 75%). I’ve selected a few that lean towards being unsuccessful to contrast with the somewhat successful initial sketches. I think part of the reason for the high proportion of stronger compositions is due to the their simplicity (in particular the number of stripes); this is despite the softness of edges, widths and colours being random and evenly distributed. There is quite a bit about Ad Reinhardt that resonates with this project. Thomas B. Hess saw Reinhardt as being an “inventor of patterns, not of forms”, which is interesting to consider in relation to the Zombie Formalist generative approach and the notion of pattern as form. There is also the emphasis on the square in his later work, and also his adherence to near invisibility due to extreme low contrast (as in image above). In viewing such dark images on my display I realized my reflection was much more dominant than the content, which plays nicely with the machine that watches the viewer. 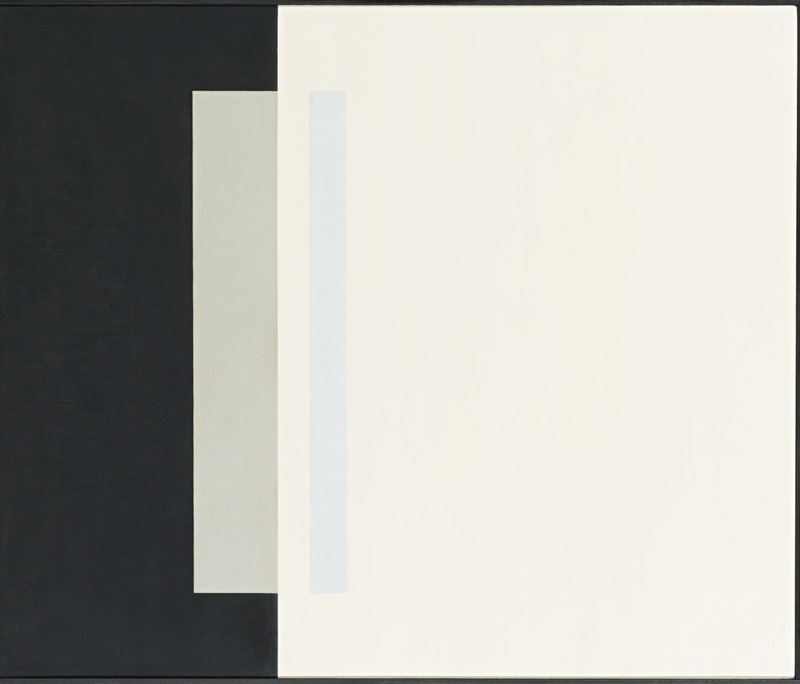 The focus on timelessness and universality is interesting and Claudine Humblet in The New American Abstraction (1950–1970), asserts that Reinhardt’s work “rediscovers a certain origin of the mystery of creation”. This is an interesting mirror of my interests in computation and generative art in relation to origination. For Reinhardt, “pure painting” should be devoid of emotional and intellectual content and whose meaning is not detachable or translatable, independent, which may be the case in the meaningless works of the ZF. The notion of the New Academy emphasizes a lack of texture, brushwork or calligraphy, sketching or drawing, forms, design, colours, light, space, time, size or scale, movement, object, subject, matter which seems quite aligned with the ZF. 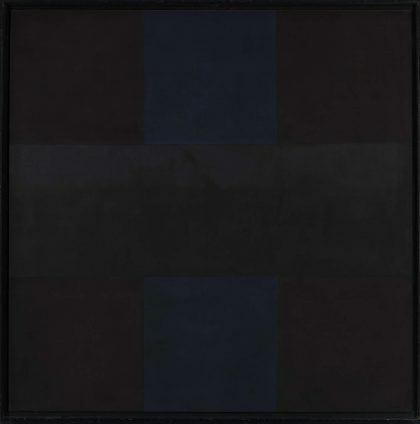 There is also Ad Reinhardt’s rejection of commercialism and assertion that art should be useless that is interesting in the context of the ZF being a pure generator, but one constrained and shaped by the whims and behaviour of the viewer, disrupting the random processes and perhaps enabling scarcity. The ZF could be somehow both an example of a “pure” art, but also an anti-pure art. Barnett Newman was one of the main references when I first starting thinking through the “zip” (vertical stripe) aesthetic for this project. While Newman fits in with Rothko in terms of a borderline fetishization of the primal, I see quite a few overlapping concerns. Like, me Newman also sees art as being rigorous and removed from chance or the arbitrary. Newman also sees art as a mission to contest styles and conventions, which is interesting the context of my thinking about art as a process of articulating what art is. Newman was also highly preoccupied with the concept of origination, the origin of the universe in particular. In his context, this takes on a spiritual / religious connotation, whereas I am interested in scientific bases of origination. It was actually this idea of origination that motivated my grad studies and interest in dreams and creativity. This probing of origination or foundations of structure connects with his interest in starting from a tabula rasa and questioning the foundations of geometry. This is challenging to algorithmic work limited to a particular set of possible geometries computed by the machine. In my case, perhaps, the geometry of sine-waves. There is still a question of composition though, sine-waves are more a underlying vocabulary and do not define the whole of the compositional system. Highly relevant to the ZF is Newman’s interest in the Sublime that transcends “categories of value” which relates to the critique of art as commodity implicit in the ZF. Again, we have an interesting relation between the artists work and the viewer. As described by Claudine Humblet in The New American Abstraction (1950–1970), Newman’s works’ “…sole aim is to convey the space against which Man measures himself.” This is very interesting considering my previous reflections on the work (the AI enabled work in particular) as a mirror of our understanding of ourselves. In the context of this project, this space could be the machine (as external model of cognition), or even social media itself. Newman wanted the viewer to gain an awareness of themselves through the work; not just a surface awareness of self, but self as a ‘totality’ both connected to separated from others, mirroring my interest subjectivity as the projection of imaginary boundaries.